Mali Mish - Day 160: Our television debut courtesy of Boxfotos Airstream. Day 160: Meeting Boxfotos and a tour of a TV station. For the last couple of weeks, we have been corresponding with a facebook friend about our visit to Tampa. Some of you might have heard of Matt and Rebecca of Boxfotos. Matt kindly offered to give us a tour of his workplace which happens to be WFLA of Tampa. 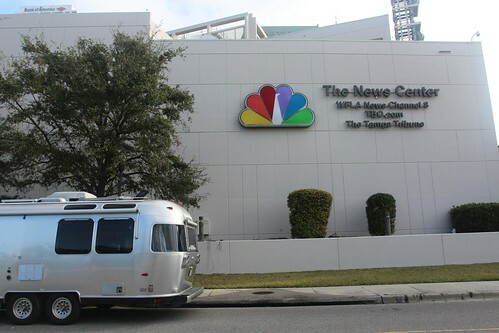 They are also the NBC affiliate of the greater Tampa area. We have never been on a tour of a TV studio so we gladly accepted his offer. 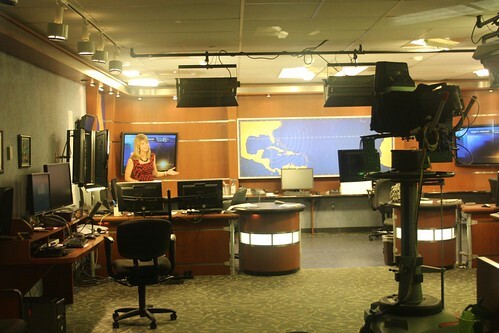 The studio at WFLA is home to NBC8 news as well as a syndicated television show called ‘DayTime!’. Matt pitched the idea of interviewing us in our Airstream to the producer of the show and surprisingly, they thought it was a good idea. One of the things we had to do is to pull the Mish from Fort De Soto to downtown Tampa this morning during rush hour traffic. We had not been looking forward to doing it but it turned out to be not a big deal. We had to be there by 9:30AM which was no easy task, especially since we had to pack up the Airstream. 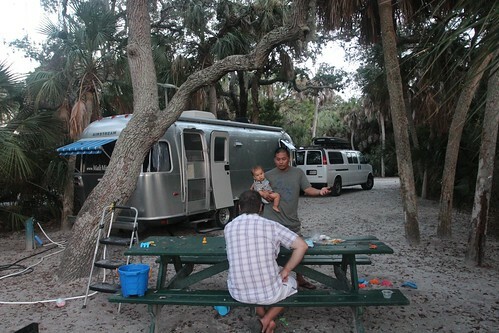 Last night being our first night at Fort De Soto, we just didn’t bother to unhitch. Guess who else is on this episode of ‘DayTime!’? A huge dude in a red shirt, black bandana and a blonde goatee that is known to rip his shirt off from time to time inside a wrestling ring. We had a little bit of time before we had to shoot our segment of the show so Matt gave us a tour of the studio first. This is where the local news is shot. They are actually live on the air right here. What you might notice is that there is no one standing behind those cameras. They are all robotically controlled from a single station. Even the weather lady’s camera is connected to the master control station. She is not even in the same room. Actually, she is not even on the same floor. Here she is telling the people of Tampa that while the rest of the country is freezing to death, we are looking forward to sunny and 80 degree days. 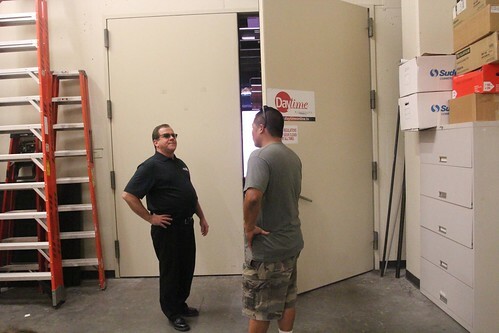 We walked by another room that gave us a little glimpse of what is going on in the other studio where DayTime! is shot. That is that guy we saw earlier sitting in the hot seat. 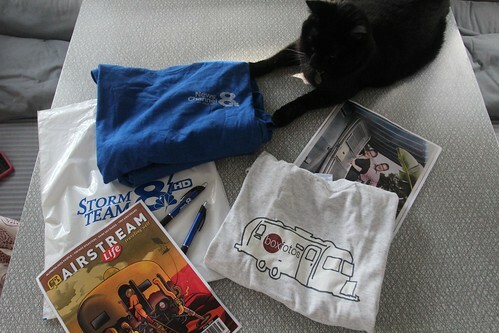 Shortly after our tour, we headed back out to where the Airstream is parked and met with the hosts of the show. That is Cyndi in the red and Lindsay in the black. If you think Lindsay looks familiar, you are not alone. She was a cast member of Real World Seattle on MTV back in the early 90s. You might remember that if you are old like we are. Our segment was brief but it was fun to do. We just had a short segment and the crew didn’t have a lot of time to prep us and the hosts so not all of the information was accurately presented. But the important thing is that the spirit of what we are doing is all in there. Typically for a segment like ours, they would have prepped us with a handful of the questions they are going to ask us ahead of time so we can sort of get our answers ready. For some reason, we just winged it. 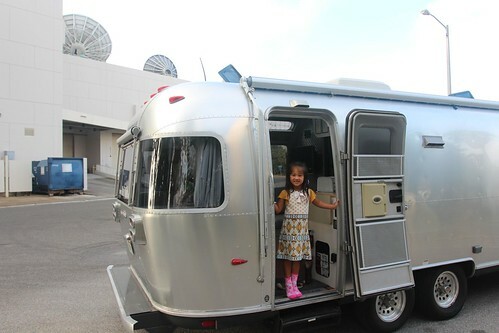 I started with Cyndi outside of the Airstream and then we walked inside to see Marlene and the kids already there. Marlene was hoping that she would not have to do much talking but Cyndi definitely put her on the spot and she did great. After the filming, we asked Matt if he was interested in joining us for lunch. 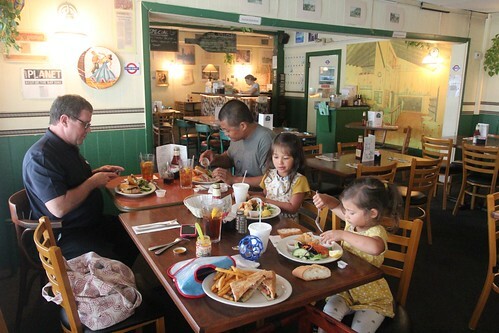 We ate at a great English place right up the road from the studio. 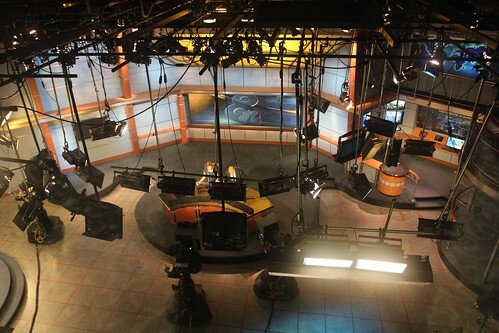 In the afternoon, the studios are pretty quiet as most of the production is basically done until the evening news starts. We got to get back in and see some of the spaces in person. Here are the girls checking out the indoor set of DayTime!. Matt gave us a tour of the other areas of the building. WFLA had gone through a merger with the Tampa Tribune newspaper to form a multimedia content delivery platform. Part of that meant the intermingling of staff and spaces. The experiment didn’t quite work as planned and now they have decided to revert to how things use to be. 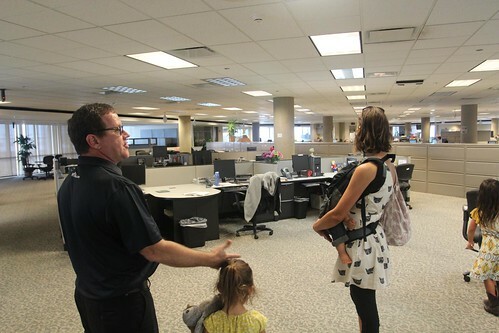 This is the floor where the newspaper once had operated. In a few weeks, everyone on this floor will be moving back next door back into the Tampa Tribune’s building. 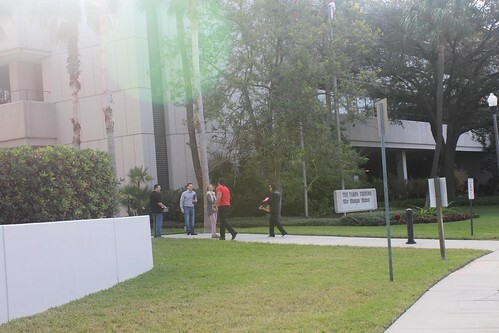 Since Matt was once an employee at Tampa Tribune, we got to see the newspaper side of the building as well. 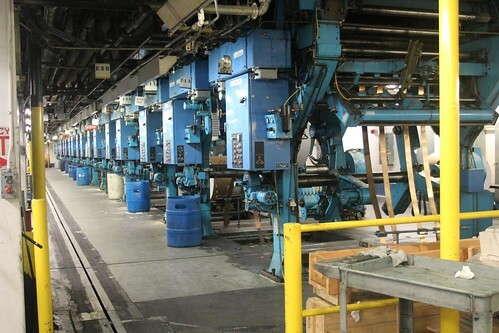 This is a multi-million dollar printing press. Obviously the Tampa Tribune is printed here as well as all of the USA Today distributed around the area. 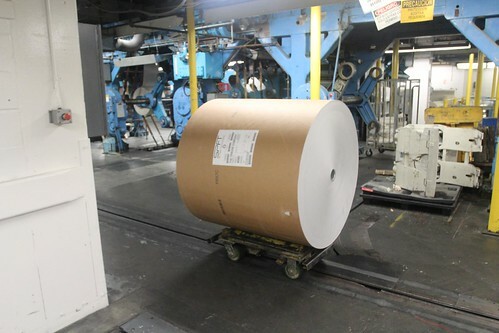 No, this is not the world’s biggest septic-safe, one-ply toilet paper, it is a giant ream of newsprint. 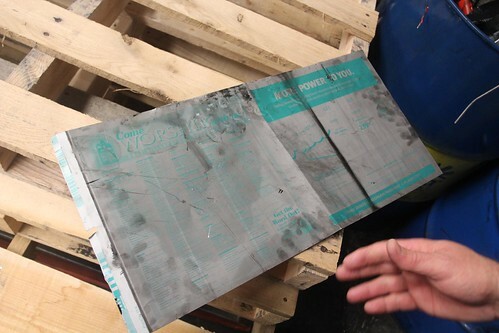 Here is a plate of what the press uses to make all of those words magically appear on that giant ream of paper. Thanks Matt for giving us a great tour and especially for getting our mugs on TV. We had a blast. Day 159: Back to Fort De Soto County Park. Day 161: Mail, Maintenance and Marshmallows. 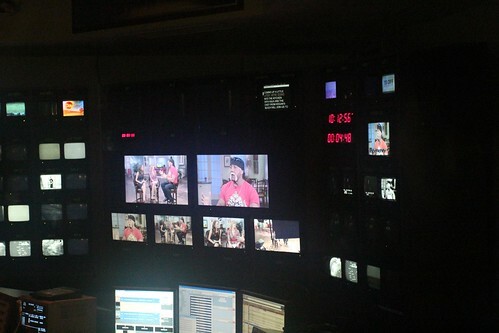 11 Responses to Day 160: Meeting Boxfotos and a tour of a TV station. Well ain’t that something! !glad you had a fun day out! Wonderful! Well done, very spontaneous feeling and natural. A great spot on your family and lifestyle. You should be very proud of yourselves. Very fun! Love the video, fun to hear your voices! Thanks for posting. Nice job! You guys did great! Love it! Your family is really inspirational! Plus, your doing it in style! You did great Lin Family!! Especially you Marlene! Finally got to watch! Great job! What fun! @Anna, a lot of stuff might have gotten stuffed in the shower and oven!